The Caribbean island nation of Antigua and Barbuda has again protested to the World Trade Organization regarding the United States’ failure to offer fair restitution in the online-gambling trade dispute between the two countries. In the latest hearing before the WTO’s Dispute Settlement Body, held on Friday, Antigua’s representative, Sir Ronald Saunders, again protested the ongoing failure of the US to make a legitimate to offer the dispute, in which Antigua is now due roughly $270 million from the US in alternate consideration. The dispute between the two countries over the US’s failure to allow Antigua-based online-gambling companies to market their services freely to US customers has gone on since 2003. The WTO has repeatedly found the US in violation of the applicable trade agreements, which it signed in the late ’90s. Roughly a decade ago, the WTO ruled that Antigua was due $21 million annually by the US, but not in direct money. Instead, the WTO ruled that Antigua could make its own versions of various US intellectual-property goods, and abrogate (“ignore” having to pay those US-based copyright holders until that $21 million cap was reached. Between the difficulty of manufacturing and marketing WTO-approved knockoff goods of such items as music, movies and software, and the US applying significant pressure to Antigua to not go ahead with what the US has termed “state-authorized piracy,” it’s been tough for Antigua to attempt to collect that $21 million annual stipend in the way the WTO allows. Antigua has threatened to do so several times, as a way of forcing the US to the bargaining table, but it’s really just been a decade-long of chicken. 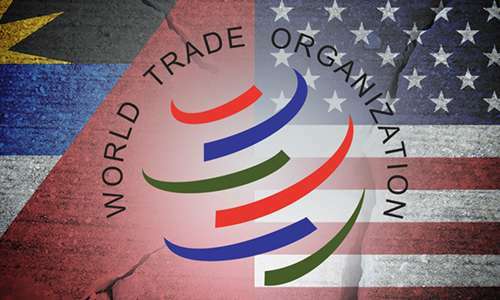 Antigua does receive other aid from the US, and the US has repeatedly threatened to cut off some of that aid should Antigua go ahead and collect its WTO-mandated award. If there was one thing new in Saunders’ WTO speech, it was that the US had indeed made a lowball offer last year of $2 million. That’s actually less than one percent of the $270 million Antigua is owed. It’s also the second such chicken-feed offer the US has made; several years back, the US offered a few hundred thousand plus “other considerations”. As gambling-world soap operas go, the Antigua-v-US tale shows no signs of being resolved any time soon. The WTO is like most international organizations in that it’s all but toothless when a dispute arises between economically mismatched nations. The US has little reason not to go right on ignoring Antigua’s pleas and threats, and until something changes, it’s the current status quo. It continues to be most unfortunate that, despite 14 long years of deprivation, Antigua and Barbuda has to appear before this body, year after year, to report that the United States has not seen it possible to offer fair and equitable terms to my small country for the significant losses in trade revenues that it has suffered as a result of U.S. violation of the General Agreement on Trade in Services (GATS). At the last meeting of this body on 23rd November 2016, at which this matter was discussed, the delegation of the United States indicated that it had offered “a broad range of useful suggestions to settle this dispute in November 2013, only to have Antigua ignore the U.S. offer for a long period of time before finally indicating that it was not acceptable”. For the record, Chair, my delegation is compelled to advise that, in accordance with the award made to my country by the Arbitration Panel established by this Body, the trade losses to Antigua and Barbuda now stands at more than US$200 million. The U.S. offer that my Government found “not acceptable” did not amount to $2 million. It should be no surprise, therefore, that my Government could not accept the offer. It cost my small country much more than $2 million simply to bring the trade dispute to the attention of this Body and to seek redress in conformity with established and binding rules. The U.S. delegation also told this body last November that “pursuant to Article XXI of the GATS”, the U.S. offered “a generous package of services concessions as compensation for removing internet gambling from the U.S. schedule”, adding that “Antigua is the only Member to block the United States from completing this process”. My delegation is further obliged to point out that my Government has not “blocked” the United States from removing its commitment from its schedule. We have acted to safeguard our rights. And at such time as the U.S. makes a fair, equitable and just offer to Antigua and Barbuda for the extreme harm done to our economy, we stand ready to act in an appropriate manner consistent with the rules of this Organization that the U.S. helped to fashion. Chair, other countries – not named by the U.S. delegation last year – have released the U.S. from its GATS obligations in this particular matter because, although these countries did not pay the cost of bringing it before this Body, the U.S. has settled their losses in ways that remain undisclosed to this Body and to my government. It can hardly be fair or just that the U.S. has reached settlements with other countries and not with my small country which was the principal victim of losses in trade revenues and employment. The delegation of the United States also told this Body last year that “the regulation of cross-border gambling is a matter of public morality”. Consequently, my delegation is obliged to point out that in April 2005, the Appellate Body of this organization found that the U.S. could not invoke a “morals defense” to its violation of the GATS. What is more, while the U.S. has banned internet gaming from foreign providers, domestic gambling service providers continue to operate and thrive. Last November, the U.S. delegation advised this body that the government was reviewing “the most recent communication” from my government and that it “will continue to work expeditiously toward finding a realistic settlement”. It is with profound regret that my delegation has to advise that 10 months later, my Government has not received a response from the U.S. despite many overtures, including our most recent letter of 5th June 2017 to the US Trade Representative which has gone unanswered. Chair, my delegation points out that the size of Antigua and Barbuda’s economy is a mere US$1.4 billion; the size of the US economy is US$18 trillion. Further, over the 14 years in which my small country has suffered trade revenue losses in this particular matter, exceeding US$200 million, we have in no way taken any hostile or retaliatory action against the U.S. Indeed, the contrary is the truth. For, over that same period, the U.S. enjoyed a trade surplus with Antigua and Barbuda of U$2 billion, as we continue to purchase almost 70 per cent of goods and services from the U.S.
We have not diverted our purchases away from the U.S. market. Therefore, while the trade revenues losses to my small country is almost 20 per cent of our Gross Domestic product, settling with us would represent only .0011% of one year of the GDP of the United States. Chair, my country has just suffered enormously from the ravages of Hurricane Irma. Three weeks ago, the island of Barbuda, our second most populous island, was completely decimated by the Category 5 hurricane’s battering which left all the inhabitants homeless and with no potable water, no electricity, no hospital and no school. My government was forced to declare the island a disaster and to evacuate all the residents to Antigua where they are now being maintained in difficult and cramped circumstances despite our best efforts with limited resources. For the first time in 300 years, there is not a single permanent resident on Barbuda, and Antigua is faced with an unexpected and unscheduled increase of 3 percent of its population and all the demands that such a sudden influx of people entails. Additionally, we are confronted with an estimated cost of more than US$250 million to rebuild Barbuda and to resettle its inhabitants in their homeland. There would be no better time than now, for the United States to settle this long-running issue which mars an otherwise friendly relationship between our two countries that has existed for generations. Of course, Chairman, Antigua and Barbuda has the option of implementing suspension of U.S. intellectual property rights which is the award given by the Arbitral Bodies of this Organization. Over these many years, we have not done so, not because we can’t, or because we haven’t had offers to help us implement the award in a transparent way and consistent with the DSB’s authorization. We have not done so because we have too high a regard for the U.S. owners of intellectual property who have contributed much to the enjoyment and advancement of the world. We had hoped that the U.S. government would respond to our restraint in ways that would settle this issue without causing any loss of income to U.S. copyright holders. Chair, we are aware that in 2010, Brazil was awarded the right to suspend payment of U.S. intellectual property rights in compensation for trade losses. The US settled with Brazil by cash payments of over US$440 million and other ways in 2010 and 2014. It would be very regrettable, Chair, if tiny Antigua and Barbuda were compelled to be the first country to have to suspend payment of U.S. intellectual property rights despite its best efforts to reach a settlement with the U.S., its largest and richest neighbour to whom it has always been – and remains – a friend.